An online betting site will provide access to a range of betting markets. These are shown in image 1. Betting markets will be split up between specific sports, and then further arranged by the date of event, national league, tournament, race meeting, fixtures, type of bet, etc. For example a live televised Barclays Premier League Football match there could be up to 200 different markets to bet on (including Match Odds, Correct Score, Half Time/Full Time Result, Half Time Result, First Goalscorer, To Score, Handicap Result and many others.). Most betting sites use the same terminology for describing the vast choice of possible bets available online. Online bookmaker customer service departments will clarify any confusion regarding markets. Familiarity with betting markets is best achieved by carefully, browsing through a number of different betting sites. Customers should only place bets on markets they fully understand. Once a desired market is selected, odds for each selection/outcome will be presented. The odds on a market selection are a simple mathematical expression which uses the stake amount (the amount of cash that is gambled on the bet) to calculate the potential bet profit. At different odds profits will vary, a bet that is very likely to happen will have short odds and a lower profit than a bet that is less likely to happen which has long odds and a higher profit. The odds demonstrate the bookmaker assessment of the risk (with greater risk leading to greater reward). 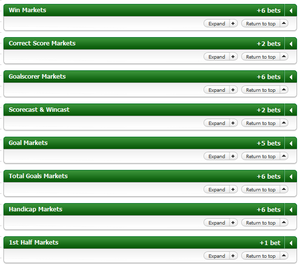 When placing multiple and accumulator bets the stakes multiply together to give odds of all happening together. Our multiples betting guide and our accumulator betting guide give full details of how this works. Odds are presented in one of three main ways. Most online betting sites offer Decimal odds and Fraction odds. This allows for switching between the two (conversion). American odds are the default offering by US bookmakers. 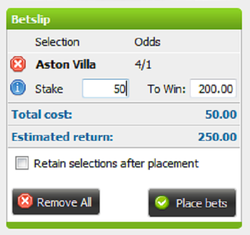 Stake: The amount of money risked on a bet – this is also the potential opportunity loss of a bet. Profit: The net gain of a winning bet, this is also called the winnings. Decimal odds multiply the stake by the odds to give the total return. This means that at odds of 3.00 the stake multiplied by 3 gives the potential payout. You would then need to take off the stake to give the profit from the bet. Fractional odds divide the stake by the bottom of the fraction and multiply by the top to give the potential profit. This means at odds of 6/4 the stake would be divided by 4 then multiplied by 6, effectively being one and a half times the stake. With any winning bet you would then receive your stake back on top of the profit. American odds show how much you would need to stake to gain a profit of 100. This means they can be negative numbers or positive, with negative numbers showing at short odds. So if the odds are -160 you would need to stake 160 to gain 100, if the odds were +400 you would gain a 400 profit off the 100 stake. These odds can be confusing and are not a popular choice for UK bookmakers. Regardless of the odds choice selected, most bookmakers will show the potential profit and/or returns on the betting slip before final submission of the bet, the table below shows this at short odds, even money and long odds. Once you have found a selection at odds which are suitable to you preferences, you will then have to input a stake. The stake equates to the liability (potential loss) of the bet, so the amount you risk or stand to lose. In the table above this would be 10. When a bet is placed the stake is deducted from the betting balance, this is so if the bet loses the bookmaker has access to the cash. This is why the return includes both the winnings, and the stake which is also due back. This works in the same way as when paying cash to a high street bookmaker at the point of making a bet. A common error made by new online betting customers is not to confirm a bet. Some bookmakers may require a click once to submit the bet and then again to confirm the selection, it is important to wait until a receipt has been shown, or for the account balance to adjust. If a genuine stake or place error has been made (such as the wrong selection or wrong stake amount) then it is advisable to contact the online betting company’s customer services department as soon as possible. They may be able to alter or void individual bets on request. The odds of some events can alter very quickly, particularly very close to the start of an event (very common in Horse Racing). As well as this the odds may alter with changing market information, for example player fitness or availability. An appreciation and familiarity with factors that can alter odds in the build up to an event can assist bet selection. When placing an inplay bet the action will not be activated for approximately 5-20 seconds after confirming the bet (see Image 3). This is fractional delay is imposed by an online betting company to protect themselves from sudden changes taking place which would alter the odds dramatically (for example, a goal or sending off in a football match). Settled bets will be reported as win, lose, void or place. Void bets are those cancelled by the bookmaker with the stake returned, the most common example being if a horse fails to start a race (a non-runner). A place result is common to horse racing and arises where a horse has not won, but ends the race in a specified top position (e.g. the first three), depending on the bet made, place results may receive a payout. If an event has a non-runner or non participant this can lead to a deduction in the payout for winning bets. For example if a horse at 5/1 fails to start a race then the payout for the winning horse will be deducted by a percentage representative of the fact it was easier to win due to the non participation of a rival.